Apartment of 43 sqm just restored consisting of 1 double bedroom, 1 living room with kitchenette and sofa, 1 mezzanine with double bed, 1 bathroom. It is located on the third floor of a Umbertine building from the early 1900s; the view is suggestive. Everything is furnished with taste and quality. From the apartment you can reach the Colosseum in 15 minutes on foot, in 10 minutes, always walk to the Basilica of Santa Maria Maggione and in 1 minute to the Basilica of San Giovanni in Laterano. This was a great little place, 15 minutes walk from the Colosseum and the centre of Rome. Shops and restaurants just round the corner or up the road. Metro and bus stops were a couple of minutes walk from the front door. Not that we used them, we walked to and from the apartment each day. A bustling, busy district full of life. If you're not used to city noise, you'll need ear plugs at night. Inside was brilliantly clean and equipped. With extra touches, like cold water in the fridge and body wash and soap in the bathroom. The beds were comfy, with fresh, spotless bed linen. Alessandro and his family were lovely and welcoming and were available if we needed any assistance. We had a super time and would definitely stay here again. Thank you for our stay! wonderful! great location! has all that you need! my son and i stayed at here for 5 nights. it was perfect for us! spacious, very clean, amazing location! full kitchenette! fantastic. we would stay here every time! Very good location, great value for money. We are a family of four who spent a wonderful week in Rome over Easter. The flat is not huge but it does the work and is well equipped and perfectly clean. Located close to the Metro, a bus terminal and Colloseum. A great base for exploring wonderful Rome. First off, let me start by saying Alessandro was a great landlord! He already had a few refreshments for us by the time we arrived. He was so accommodating! Our flight arrived early and he went out of his way to meet us at the apartment 2 hrs early!! I was VERY thankful or else we would have been standing out in the hot sun with all of our luggage. The apartment felt like home by the end of our two week stay. It was very spacious so we had plenty of room for 3 people. Not only was it spacious but it felt like the safest place in the entire city!!! It is about a 5 min walk to the metro line B (San Giovanni stop)... (when leaving the apartment turn left then right at the main street. Walk all the way down past the bus stop and taxi stop, cross the intersection, walk under the arches, keep walking about 30 steps and you there! Just walk down the stairs ). If I was in Rome again, I wouldn't stay anywhere but alessandro's place. We had a wonderful time staying here while we were in Rome! We arrived at the apartment by subway and it was only about a five minute walk from the Manzoni station. We arrived at the building and were buzzed in by Alessandro right away. The apartment is accessed by a tiny elevator or a marble staircase. The building was very quiet. The apartment was clean with plenty of space. The bathroom is snug, but has everything you need and we never ran out of hot water. We ate out every night so we didn't use the kitchen. The bedroom was bright and pretty and the bed was comfortable. The windows opened right onto some ruins. We were there in May and the temperature was perfect. In the morning we would close and latch the heavy outside shutters to keep out the sun and at night when we got back home we would open the windows to catch the cool breezes. We didn't need to use either the air conditioning or the heat. The street below is busy and it was fun to look out the window and watch the traffic and the pedestrians. The apartment is between two subway stations and has easy access to buses and trams. My husband took walks in the early morning and we often arrived in the late evening and we always felt safe. We loved the Rome Subway system and found it easy to get to the Vatican Museum and the Villa Borghese. The Colosseum was just over a kilometer away so we walked (about 20 minutes) and sampled fruit, pastries, and gelato along the way. Thank you so much for a great stay! Great Place & Great Location! My boyfriend and I stayed here for four nights at the beginning of December and loved it. Alessandro's directions from Termini Station were easy to follow and the location was great to see all of the historic sights in Rome. The apartment is perfect for two people, though it sleeps six. It was great to have the ability to make meals at the apartment to save a bit of money (though every meal we ate out in Rome was amazing!) and there were a few markets close to pick up a few groceries to tide us over. Alessandro provided us with a map where he pointed out the closest markets for us. You are literally just a ten minute walk to the Colosseum & Roman Forum, and a quick train ride to Vatican City. We took the Metro to the Trevi Fountain and it was a quick and easy trip. Listing description was accurate, the photos capture the charm of the place and the property was clean and well maintained! All in all it was a great stay and if we ever come back to Rome again we will definitely stay here again if it is available! We do recommend this place (and have told everyone about it when recalling our trip!) Thanks for the hospitality, Alessandro! 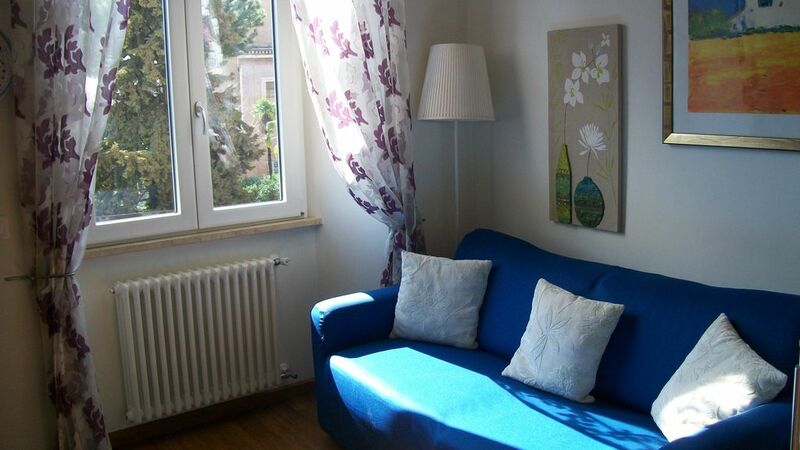 Lovely apartment third floor overlooking the gardens of the holy stairs opposite Piazza S. John Lateran. Colosseum, the Imperial Forums in 10 minutes (walking) Piazza Venezia and all the beautiful places of the city (Trevi Fountain, Spanish Steps, Via del Corso ...), within walking distance. Still under house they are all public transportation (metro, bus, tram). l'appartamento si afffitta minimo a 2 persone. Il prezzo per l'intero l'appartamento va da 60 euro a 90 euro a notte a seconda del periodo e delle persone.